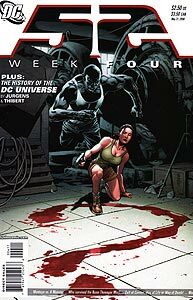 Brief Synopsis: The world turns towards the search for the missing space heroes lost during the Infinite Crisis. Issue Notes: Booster's stock is on the rise as his string of heroic public endeavors grows. PRODUCT PLACEMENT: "Week 4, Day 1." 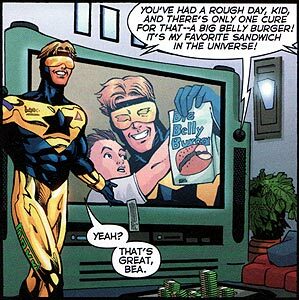 Inside Booster Gold's penthouse apartment, Booster meets with Fire while his large screen television plays footage of his endorsement of the Big Belly Burger restaurant chain following Booster's rescue of a falling child identified as Thaddeus Star. (Thaddeus Star will become the father of the 22nd-century hero Space Ranger.) Booster was forced to work in a Big Belly Burger franchise during the Super Buddies brief imprisonment in Hell in JLA Classified #6. Big Belly Burger has franchises throughout the DC Universe, first appearing in Metropolis in Adventures of Superman #441. Angered by the return of Booster's "me first" attitude, Fire burns the Banana Co. patch off of Booster's uniform. Fire is a native of Brazil, which as recently as the year 2004 was one of the four countries producing half of the world's banana crop. The "Ted" that Fire mentions is Ted Kord, the deceased Blue Beetle II and Booster's best friend. Among the papers visible on Booster's table is a list of names beginning with Rip Hunter. Rip Hunter is the DC Universe's master of time travel who built the time machine that first allowed Booster to travel back to the present from the year 2642. The following names on the list are Jeffery Smith and Bonnie Baxter, companions of Hunter that Booster last met in Time Masters #4. The final listing is for the previously unseen S.T.A.R. Labs Time Travel Division.